I arrived with no appointment 10 minutes before the posted opening time. I tried the door and it was unlocked so i went in. I was immediately served even though the store wasnt officially open. Very impressive. Most stores have a locked door until after the opening time. They fir me into the schedule. I went for coffee and they phoned to tell me the pressure sensor was shot and I approved installing a new one. Before I was finished my coffee they phoned that my car was ready. They checked the tire (no charge) and installed a new sensor. Reasonable price. Told me if I had any trouble with the tire going flat theyd fix it for free. I was so impressed. I told my wife about it and we agreed well never buy a set of tires anywhere else. With the snowy weather forecast for the area this week, and my car running all year on the same tires as when I had bought it a year ago, I thought to myself, "gotta get some tires for winter". Stopped into KalTire with my grandson, who loves to learn about everything. Asked to make an appointment for 2 new tires. The service agent took a look at my current tires, and asked me to move into a well lit area to better check. Took his time to check all 4 of my tires, which do not need replacing! He recommends getting summer tires this spring, to save the winter tires, but other than that, he talked his business OUT of a winter tire sale and install!! Very sure I will return with my next tire purchase, very honest sales people. The folks at this outlet are very good at what they do. Yesterday I discovered one of my Winter tires had gone flat in storage, so I took it to their shop to get repaired. Not only did they sort it out the same day (a slowwww leaking tire pressure sensor valve), but they didnt charge for it. I took the tire to them because two years ago I had to replace the tires on my wifes Subaru ( a different car than mine), and found the experience to be good, and their advice on the money. They suggested she consider replacing her "all seasons" with "All Weather" tires. It was a great suggestion, and has proven its worth in the winter as well as the summer. Far superior to the All seasons. I have dealt with Kal tire a few times now and have been very pleased with their work. They have been pleasant on the phone, quick to book an appointment and very good at explaining what needed to be done. After installing winter tires they courteously explained why I should consider replacing my summer tires as they were 10 years old. There was no pressure, just an honest explanation. All of the employees are cheerful, courteous and helpful. I recommend Kal Tire on Keating X Road to my friends and will certainly continue to deal with them myself. Bought 4 nokians that started to leak within a year. beads not cleaned and not sealed properly. Kal tire said could not find the problem. Took the car to another installer - problem solved. Bought a new diehard battery from kal tire within a few months it would no longer hold a charge. Kal tire said "drive the car more often and put a trickle charger on it". The battery continued to loose its charge. Took the car to another supplier who replaced the battery - problem solved. I would not recommend Kal tire. Good practical advice given about which tires to get for my Subaru all wheel drive! About an hour in which to install all of the new tires! A little sitting room to watch TV and drink coffee! During this time, they inspected the brakes, topped up the washer fluid, inspected wiper blades, battery, lights, ball joints, wheel bearings etc. Excellent service! Thank you! Keith and the team at Kal Tire are amazing. I got a flat tire just down the block, and they helped me get my car to the shop, patched it up, and got me back on the road in under an hour. Not only this, but they decided to make a gift of the service, just asking that when I needed new tires next, Id think of them. Well guys, you can count on it! Thanks again!! Brought car in to replace winter tires. Summer tires no longer useable. Kal Tire ordered new tires, advised when they arrived. Scheduling of replacement was a breeze and work was completed quickly and proficiently. Bill less than I expected. I have used the Keating location a number if times. Always an excellent experience. These guys are amazing. Ive had multiple flats over the years and every time I get the... "Its on us" when I pull out the wallet. Awesome service and has always been my go to place for tires and repairs. Cant say enough good. In this day and age of better price means less service these guys are a welcome change. Exceptional service from Keith & the rest of the squad. He was incredibly helpful, informative, and went above and beyond to ensure my vehicle was taken care of in a timely fashion. Ive been a Kal Tire customer at several different locations in Alberta and BC, but the guys here are definitely the best. Thanks!! From the appointment to the final work,I couldnt be happier. HAd an alignment and oil change done, work was done quickly properly and was extremely competitive price wise. I have no issue recommending this location. Great job and thanks again. 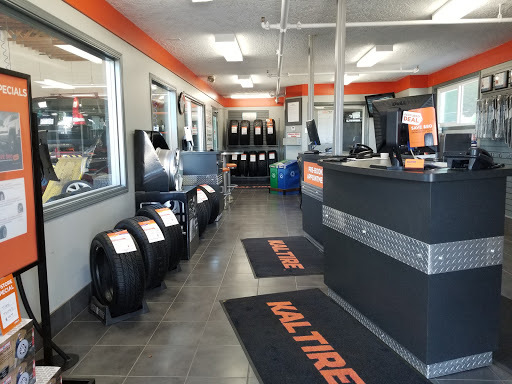 If you value customer service then Kal Tire on Keating should be your go to location. I have used them for brakes and tires repairs on numerous occasions over the years and have always found them to be pleasant and straight forward.